This month's printable is a little behind. We had quite a crazy last few days. The entire family came down with this stomach flu bug. It wasn't a pretty site and I'm quarantining my house for an entire week. Haha! We are recuperating and everyone seems to be doing pretty good now. Things are slowly getting back to normal. So back to the printable. 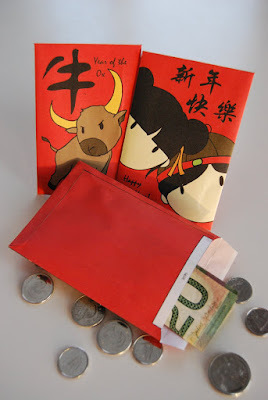 This year's Chinese or lunar new year falls on January 26th, year of the ox. So being of Chinese ethnicity I thought I would create Red Envelopes (Lai See) for this month's printable. Download the Envelopes here, PDF file. There are two different envelope designs on one sheet. Print on 8.5 x 11 paper. It's quite easy and staight forward to assemble, but feel free to post on here if you have any questions. Lucky money for the lucky new year! Enjoy!! These are adorable!!! Thanks for offering them up. These are so, SO cute! I'm working on a Chinese New Year roundup-this is perfect! I'll be linking. Absolutely perfect! I just got back from Shanghai and this is just what I needed to give our souvineers to our friends in. Thank you so much! I really love these. I don't suppose there's any chance of you doing an update with a Year Of The Tiger design? Thanks so much for these! These are perfect for my chinese themed party because my party is on Chinese New Year! Thanks for uploading these!! These are wonderful! I had trouble finding red envelopes with pictures that are appropriate for my first grade class. Thank you for sharing! Will you be creating one for each zodiac animal?